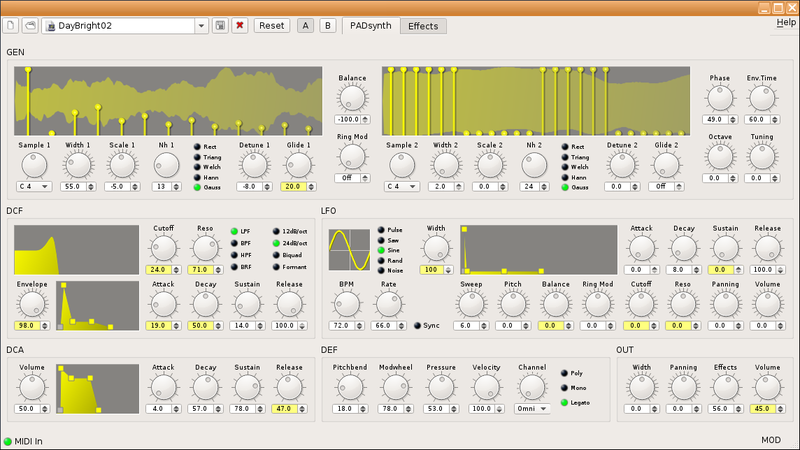 Padthv1 is an old-school polyphonic additive synthesizer created and maintained by Rui Nuno Capela. It is part of the Vee One Suite (which includes Synthv1, Samplv1 and Drumkv1), available in the KXStudio repositories and other important audio production linux distros. It can run as a standalone synth or as an LV2 plugin within a DAW setup such as Ardour or QTractor. It can run in a Jack or Non Session Management (NSM) session, and has Jack Midi and Alsa Midi support. Padthv1 is based on Paul Nasca's PADsynth algorithm. It is both polyphonic and monophonic and, like the other instruments in the Vee One Suite, includes velocity and aftertouch sensitivity control. 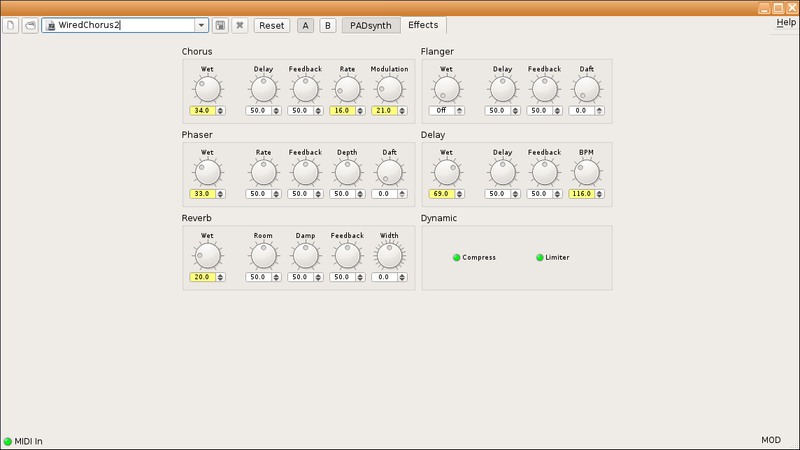 Padthv1 utilizes two sound generator sources that can provide up to 64 harmonics each. A graph is provided for each sound source, for harmonic level control. (The harmonics can be adjusted individually simply by left-clicking, or by drawing a harmonic spectrum by holding down the ctrl key and left-clicking to activate the pencil.) The waveforms will change in realtime as the harmonic levels are adjusted. Each sound generator includes the following controls: Sample, Width (adjusts bandwidth), Scale, Number of Harmonics, Detune and Glide. The waveforms are further enhanced through one of five apodizing filter windows: Rectangle, Triangle, Welch, Hann and Gauss. The global controls for the two generators include Balance, Ring Modulation, Phase Shift, Envelope speed, Global Octave and Fine Detuning. Padthv1's Filter section provides lowpass, bandpass, highpass and notch filters (both 12dB and 24dB) as well as a formant filter. The LFO section includes sine-skewed sine, saw-triangle, square-pulse, random and noise waveshapes, and an ADSR envelope for depth movement over time, with bipolar modulation possibilities for the following parameters: Sweep, Pitch, Balance (between generators), Ring Modulation, Cutoff, Resonance, Panning and Volume. The LFO rate is adjustable and can be synced to a plug-in host. The "DEF" section of Padthv1 has controls for setting pitchbend depth and modulation depth. The Effects Page provides the classic effects options common to the Vee One Suite: chorus, flanger, phaser, reverb and delay, as well as a compressor and a limiter. As with Synthv1 and Samplv1, Padthv1 is fully-assignable and controllable via external MIDI devices.